Members come to a gym to improve and maintain their health. Stretching, lifting weights, strength building exercises, and cardiovascular fitness are all parts of the workout experience designed to keep members healthy. What gym-goers don’t want to experience however, is a dirty gym that does not take the health of its members seriously. 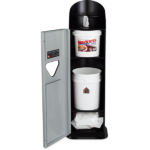 Gym owners and staff have a responsibility to provide a safe, and germ-free environment. Cultivating a community of cleaners begins with setting standards that need to be followed by everyone. But, it is not enough to just set the standards, gyms need to follow-through and enforce them as well. Since there are no governmental or legal standards for cleanliness that gyms need to follow, what “clean” is and looks like can vary from gym-to-gym. Having a clean gym lets members know your gym is a cut above the rest because it genuinely cares about keeping people healthy. A gym doesn’t have smell like a gym or stay messy until a certain time of day when it gets cleaned. The following ideas are just a few ways you can start to cultivate community of cleaners at your gym. Start speaking the language of clean with members to get them to understand your gym’s values through the power of words. Communicating the importance of keeping your gym safe and clean is a must. Let members know you are serious about their well-being and keeping the gym clean is a standard that will not be compromised. Set the expectation that members should and must be considerate regarding the health of other members- it’s a way of life at your gym. Place signage in the entranceway, locker rooms and other common areas to help reinforce the community you are trying to develop/change. Staff members and personal fitness trainers need to make sure they are modeling the behavior found in the community of cleaners. They need to “train” each new staff/gym member on proper cleaning and expectations of keeping the environment safe and healthy. Staff members should use hand sanitizer frequently, and clean exercise equipment and facilities regularly (including free-weights, exercise balls, lockers, etc.). If members see staff keeping the gym clean they will want to keep the gym clean as well. Consistent modeling of behavior is key to changing a culture. Intermittent modeling only reinforces bad behavior. Expectation is the birthing ground for change. If staff are not on board and excited about changing the culture, it won’t be changed. Go through every “room” in the gym and make a checklist of everything that needs to be cleaned. Develop these checklists into templates for each “room” and have staff test them out to make sure they are accurate. Once your templates are set, print them and assign the tasks to staff members daily- rotating duties throughout their shifts. Make sure they initial the checklist next to the task they completed so you can follow-up with them if cleaning standards were not met. Make sure to design a supplies checklist so you never run out of cleaning supplies. Let’s face it, it’s difficult to keep a gym clean. You clean one piece of equipment and then someone else pretty much uses it immediately. The most common solution gyms seem to implement is to provide cleaning stations with a spray bottle and paper towels so members can clean off the equipment after they’ve used it. Paper towels are not pliable and don’t reach into crevices of equipment. It is really hard to clean free weights using this method. Plus, most members just spray the towels first then take the towel and clean the equipment- they really are not fully saturating the towel with the solution. They also don’t take the spray bottle along with them in case they miss part of the surface area. Offering pre-saturated wipes that can be used and disposed of is more economical and much healthier for members. How many times have you seen someone carry the same paper towel around to clean more than one piece of equipment they used? 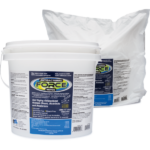 With pre-saturated wipes, all surface areas are being cleaned effectively with the same amount of “wetness.” You use one wipe and then throw it away, eliminating the temptation to use the same wipe on multiple surfaces. Wipes can also be used in the locker rooms as well. Who wouldn’t want to clean their locker before putting their belongings in it? Hand sanitizers everywhere! Hand sanitizing stations should be strategically placed throughout the gym. Encourage members to use sanitizing stations regularly (especially during cold and flu season) pre-workout, and post-workout. Don’t forget to place sanitizing stations in the middle of the gym to make it convenient for members during mid-workout. Hand sanitizers add another layer of protection for high touch surfaces and to the gym as a whole. Don’t give up if the new community of clean doesn’t catch on at first. Changing an organization’s culture can take time. The good news is that gym members are already concerned about their health so cultivating a community of cleaners should catch on fast. Be determined and expectant that change will take place. By speaking the language of clean, using signage that clearly communicates expectations, modeling the expected behavior, developing cleaning checklists, and providing proper cleaning materials, your gym will be well ahead of the rest in setting a new standard for cultivating a community of cleaners. 2XL is a leading manufacturer of cost effective cleaning, sanitizing and disinfecting products designed for use in a variety of industries, including the fitness industry. 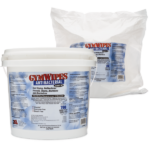 GymWipes kill 44 pathogens without harming equipment. Members will feel safe knowing that they are using products designed to kill germs as well as cultivate a community of cleaners.